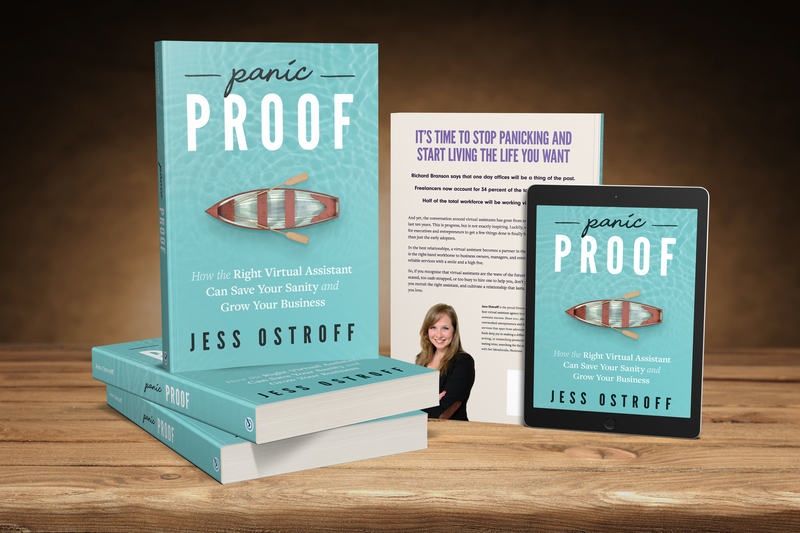 Panic Proof Available for Order! It’s time to stop panicking and start living the life you want! Richard Branson says that one day offices will be a thing of the past. Freelancers now account for 34 percent of the total U.S. workforce. Half of the total workforce will be working virtually by 2020. And yet, the conversation around virtual assistants has gone from terrible to just “meh” over the last ten years. This is progress, but is not exactly inspiring. Luckily, what started as a cheap way for executives and entrepreneurs to get a few things done is finally being taken seriously by more than just the early adopters. In the best relationships, a virtual assistant becomes a partner in the client’s business. A great VA is the right-hand workhorse to business owners, managers, and entrepreneurs—providing useful, reliable services with a smile and a high five. So, if you recognize that virtual assistants are the wave of the future, but you’re feeling too scared, too cash-strapped, or too busy to hire one to help you, don’t panic! This book will help you recruit the right assistant, and cultivate a relationship that lasts, so you can do more of what you love.